Another National Geographic TV show saw Zeb Hogan fishing at the Maeklong River with the Fishsiam team. The show was filmed over a few days and saw Zeb Hogan actually doing some fishing himself. Over a three day period several Giant freshwater stingrays were landed up to a weight of an estimated 100kg. On the third and final day the team hooked another Monster fish which took the best part of an hour to land. 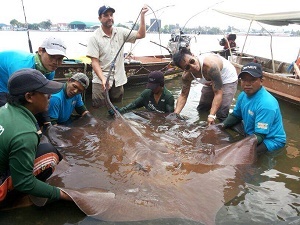 The Giant freshwater stingray was measured at a width of 1.7m’s and under the supervision of Dr.Chansue and the team from Chulalongkorn University the stingray was accurately weighed using a custom built rig and digital scales. The digital scales gave an accurate reading of 175kg’s lending further credence to the estimated weights of previous stingrays. After the film crew had finished filming the vents the Giant freshwater stingray was released back into the Maeklong River. The whole story can be seen on National Geographic channel’s latest instalment of Monster Fish with Zeb Hogan.